Google (s GOOG) opened up its music service to the public today, making it possible to buy millions of songs both through a renewed Android Music app as well as the web version of the Android Market. The service mirrors smilar offerings from Apple (s AAPL) and Amazon, (s AMZN) with a unique social twist: Users will be able to share their purchases on Google+, giving their friends and followers a chance to listen (one-time only) to singles and complete albums for free. Any purchase is automatically transfered to Google’s cloud music locker, where it can be played via the web browser or Android mobile devices. The store comes with 90-second previews, and purchases consist of 320 kbps MP3s. Tracks will cost between $0.99 and $1.29, and T-Mobile customers will be able to pay for music purchases through their monthly phone bill. The company said on Wednesday that it has secured content rights for over 13 million songs, 8 million of which are available at launch. However, just as previously reported, Google was only able to sign up three of the four major record labels: Warner Music artists such as Madonna and Green Day won’t be available for the time being. The store does have music from a wide range of indie distributors, including Merlin, IODA and CD Baby. Speaking of indie bands: Google Music includes a feature called artist hub that makes it possible for musicians to upload their own music and sell them at a price point of their choosing. Artists will keep 70 percent of their revenue, and in the future also be able to sell music directly on YouTube. One of the first artists making use of this hub is dance artist DJ Tiesto. But the company isn’t relying on small coffee shop bands alone: The launch is accompanied with a bunch of content exclusives, including six concerts from the Rolling Stones, a five-track live EP from Coldplay, as well as additional tracks from Shakira, Busta Rhymes, Pearl Jam and the Dave Mathews Band. Some of this content will be available for free, hinting at Google making some major investments to promote Google Music. Google launched the first iteration of its music service at its developer conference in May. Google Music Beta, as it was called at the time, only included the option to upload songs to Google’s cloud locker. But Android Director of Digital Content Jamie Rosenberg said that users nonetheless accessed the service a lot, streaming music from their lockers for 2.5 hours on average. Google had also started to give away promotional songs from indie labels for free, and Rosenberg said that users had downloaded more than 100 million tracks. Google lanza su RRSS musical http://t.co/tHS5wjb5 en EUA, Â¿no parece que estamos en los 80 cuando tardaban dos aÃ±os en llegar las pelÃ­culas? The best part of the Google Music launch is that of Sharing on Google + for FREE and the FREE song of the day given away by Google. See the full review, pictures and review here. 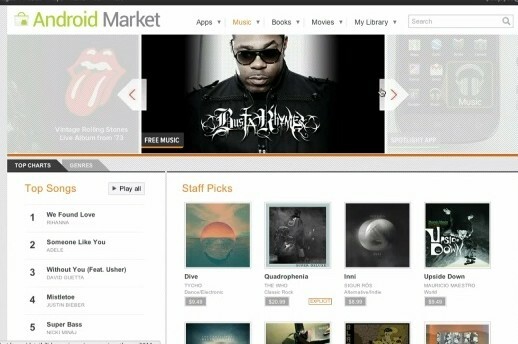 The Google take over continues w/the launch of their music store including billing to mobile :: http://t.co/mLSFFWmC :: madness!